Not to be confused with Cossack. In the West, the cassock is little used today except for religious services, save for clergy in traditionalist Catholic orders such as the Society of Saint Pius X, the Priestly Fraternity of Saint Peter, the Institute of Christ the King Sovereign Priest, the Canons Regular of Saint John Cantius, and the Congregation of Mary Immaculate Queen who continue to wear the cassock as their standard clerical attire. However, in many countries it was the normal everyday wear of the clergy until the second half of the 20th century, when it was replaced even in those countries by a conventional suit, distinguished from lay dress by being generally black and by incorporating a clerical collar. The word cassock comes from Middle French casaque, meaning a long coat. In turn, the Old French word may come ultimately from Turkish kazak (nomad, adventurer – the source of the word Cossack), an allusion to their typical riding coat, or from Persian کژاغند‎ kazhāgand (padded garment) – کژ‎ kazh (raw silk) + آغند‎ āgand (stuffed). The name was originally specially applied to the dress worn by soldiers and horsemen, and later to the long garment worn in civil life by both men and women. As an ecclesiastical term the word cassock came into use somewhat late (as a translation of the old names of subtanea, vestis talaris, toga talaris, or tunica talaris), being mentioned in canon 74 of 1604; and it is in this sense alone that it now survives. The word soutane is a French-derived word, coming from Italian sottana, derived in turn from Latin subtana, the adjectival form of subtus (beneath). Cardinal Mgr. Diomede Falconio wearing a blue cassock, exception. The cassock (or soutane) comes in a number of styles or cuts, though no particular symbolism attaches to these. A Roman cassock often has a series of buttons down the front. In some English-speaking countries these buttons may be merely ornamental, with a concealed fly-front buttoning, known as a Chesterfield front, used to fasten the garment. A French cassock also has buttons sewn to the sleeves after the manner of a suit, and a slightly broader skirt. An Ambrosian cassock has a series of only five buttons under the neck, with a sash on the waist. A Jesuit cassock, in lieu of buttons, has a fly fastened with hooks at the collar and is bound at the waist with a cincture knotted on the right side. 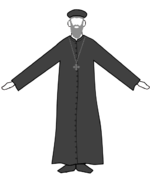 The ordinary Roman cassock worn by Roman Catholic clerics (as distinct from that worn as choir dress) is black except in tropical countries, where because of the heat it is white and usually without shoulder cape (pellegrina). Coloured piping and buttons are added in accordance with rank: black for priests, purple for chaplains of His Holiness; amaranth red for bishops, protonotaries apostolic and Honorary Prelates; and scarlet red for cardinals. The 1969 Instruction on the dress of prelates stated that for all of them, even cardinals, the dress for ordinary use may be a simple black cassock without coloured trim. A band cincture or sash, known also as a fascia, may be worn with the cassock. The Instruction on the dress of prelates specifies that the two ends that hang down by the side have silk fringes, abolishing the sash with tassels. A black faille fascia is worn by priests, deacons, and major seminarians, while a purple faille fascia is used by bishops, protonotaries apostolic, honorary prelates, and chaplains of His Holiness, when wearing a cassock with coloured trim. A black watered-silk fascia is permitted for priests attached to the papal household, a purple watered-silk fascia for bishops attached to the papal household (for example, Apostolic Nuncios), and a scarlet watered-silk fascia for cardinals. 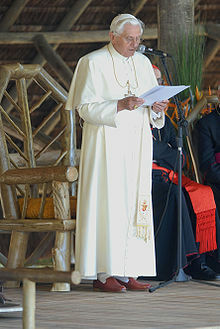 The Pope wears a white watered-silk fascia, sometimes with his coat of arms on the ends. Pope Benedict XVI in white cassock (sometimes though unofficially called a simar) with pellegrina and fringed white fascia. In choir dress, chaplains of His Holiness wear their purple-trimmed black cassocks with a cotta, but bishops, protonotaries apostolic, and honorary prelates use (with a cotta or, in the case of bishops, a rochet and mozzetta) cassocks that are fully purple (this purple corresponds more closely with a Roman purple and is approximated as fuchsia) with scarlet trim, while those of cardinals are fully scarlet with scarlet trim. Cardinals have the additional distinction of having both choir cassock sleeves and the fascia made of scarlet watered-silk. The cut of the choir cassock is still a Roman-cut or French-cut Roman cassock. In the past, a cardinal's cassock was made entirely of watered silk, with a train that could be fastened at the back of the cassock. This train was abolished by the motu proprio Valde solliciti of Pope Pius XII with effect from 1 January 1953. With the same motu proprio, the Pope ordered that the violet cassock (then used in penitential periods and in mourning) be made of wool, not silk, and in February 1965, under Pope Paul VI, a circular of the Sacred Ceremonial Congregation abolished the use of watered silk also for the red cassock. The general rule of the Roman Catholic Church is that the pellegrina may be worn with the cassock by cardinals and bishops. In 1850, the year in which he restored the Catholic hierarchy in England and Wales, Pope Pius IX was understood to grant to all priests there the privilege of wearing a replica in black of his own white caped cassock. Since then, the wearing of the pellegrina with the cassock has been a sign of a Roman Catholic priest in England and Wales, Scotland, Ireland, Australia, and New Zealand, although sometimes imitated by Anglican priests. 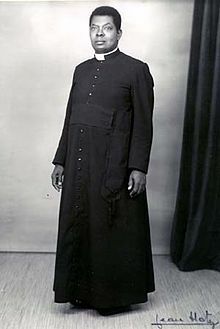 In his 1909 book, Costume of Prelates of the Catholic Church, John Abel Felix Prosper Nainfa proposed the use of the English word "simar", instead of the word "cassock", for the garment with shoulder cape, which he treated as distinct from the cassock proper. Others too have made the same distinction between the "simar" (with pellegrina) and the "cassock" (without), but many scholars disagree with Nainfa's distinction. More particularly, documents of the Holy See make no such distinction, using the term cassock or vestis talaris whether a pellegrina is attached or is not. Thus the 1969 instruction states that, for cardinals and bishops, "the elbow-length cape, trimmed in the same manner as this cassock, may be worn over it". Cassock, rather than simar, is the term that is usually applied to the dress of Popes and other Catholic ecclesiastics. The instruction also gives no support to Nainfa's claim that the cassock with shoulder cape should not be worn in church services, which moreover would be of difficult application, since the cassock with pellegrina is generally made as a single garment, with a non-detachable pellegrina. Nainfa wrote that at that time the garment with shoulder cape was in Italian called a zimarra, a term, however, that in that language is today used rather of a historical loose-fitting overgown, quite unlike the close-fitting cassock with pellegrina worn by Catholic clergy, and similar to the fur-lined Schaube that was used in northern Europe. Images of the historical zimarra as worn by women can be seen at "Dressing the Italian Way" and "The Italian Showcase". In cold weather, the manto, an ankle-length cape with or without shoulder cape, or the greca, also known as the douillette, an ankle-length double-breasted overcoat, is traditionally worn over the cassock. For bishops and priests both the manto and greca are solid black in colour, while for the pope the manto is red and the greca is white. Cassocks are sometimes worn by seminarians studying for the priesthood, by religious brothers, by lay people when assisting with the liturgy in church, such as altar servers, and by members of choirs (frequently with cotta or, more usually in Anglican churches, surplice). The double-breasted cassock fastens at the shoulders on the opposing side of the breast and at the waist with one concealed button. The latter usually has a single small stem-button sewn at centre front about 12–15 cm / 4½–6" below the centre-front neck line which is used to secure the academic hood, worn for Choir Dress. The single-breasted cassock worn by Anglicans traditionally has thirty-nine buttons as signifying the Thirty-Nine Articles or as some would prefer Forty Stripes Save One. Cassocks are often worn without a cinture and some opt for a buckled belt. Black is the most common colour for priests, readers, virgers, and server cassocks. Lighter colours, such as white are used in tropical countries and some cathedrals have colours specific for their location. Piping is also used in the Anglican church to indicate position held with red being used for Deans, Archdeacons and Cathedral Canons. Bishops and Archbishops often wear purple cassocks. This has been practise since the 19th century. More recently the Archbishops have chosen to wear black, this can be seen in the ministries of Rowan Williams and Justin Welby. Scarlet cassocks are properly worn only by Chaplains to the Queen and by members of Royal foundations such as Westminster Abbey and some Cambridge college chapels. Cassocks are sometimes also worn by readers, altar servers, and choir members, when they do this is the double-breasted style. Readers and altar servers usually wear black cassocks, but those worn by choirs are usually coloured. In the Evangelical Lutheran Churches of Denmark, the Faroe Islands, Iceland, and the North German Hanseatic cities of Hamburg and Lübeck, clergy wear the cassock with the ruff as vestments. The Cassock is also worn in American Lutheran churches as often as the clerical shirts and collar. It is customary to wear it on special high holidays such as Good Friday and Ash Wednesday. In the Church of Scotland, and Presbyterian churches which trace their heritage back to the Scottish church, they typically use the Anglican style of cassock. In addition, it is not uncommon to see full-length cassocks worn in the blue of the Flag of Scotland, which is also tied to the academic dress of the University of St Andrews. As is the custom within the Church of England, ministers of the Church of Scotland who are chaplains to the royal family also wear a scarlet cassock. Over this is typically worn a preaching gown or the academic gown of the minister. During the Edwardian and Victorian era, it was common to see a shortened, double-breasted black silk cassock worn under the gown. It generally reached to the knees and was tied with a simple cincture. However, with the liturgical movement of the 20th century, the classic cassock came back into fashion. Presbyterians in Canada tend to follow the custom of the Church of Scotland, whereas Presbyterians in the United States typically wear an American Geneva gown over a sleeveless cassock or a non-cuffed gown over an Anglican or Roman style cassock. The American Geneva gown is often supplied with a cuff sewn into the double-bell sleeve (this innovation is a remnant of the cassock sleeve that was formerly worn underneath). As is the practice in the Anglican churches, cassocks may be worn by others who are not ministers. Ordained elders and deacons, as they serve as worship leaders, readers, and administer communion may also wear cassocks which tend to be black. Those worn by choirs and other worship leaders are usually coloured (for instance, The Shadyside Presbyterian Church (U.S.A.) choir is dressed in red cassocks under white surplices). In Eastern Christianity there are two types of cassock: the Inner Cassock and the Outer Cassock or Rason. Monastics always wear a black cassock. There is no rule about colouration for non-monastic clergy, but black is the most common. Blue or grey are also seen frequently, while white is sometimes worn for Pascha. In the Eastern Churches, cassocks are not dress for any lay ministry. Generally, one has to be blessed to wear a cassock usually in the case of exercising a clerical duty. The inner cassock (more often simply cassock) is an ankle length garment worn by all major and minor clergy, monastics, and often by male seminarians. The Slavic, or "Russian" style (Russian: подрясник podryasnik, Ukrainian: підрясник pidryasnyk) is double-breasted, closely fitted through the torso and flaring out to the skirt, with a high collar buttoned off-center, and may be cinctured with either a leather or wide cloth belt. The Greek version, called an anteri (αντερί), rason (ράσον), or zostiko (ζωστικό) is somewhat fuller, gathered at the waist with a narrow cloth belt, and with a high collar buttoned in the front. The inner cassock is usually worn by all clergy members under their liturgical vestments. The outer cassock (Russian: ряса ryasa, Ukrainian: ряса ryasa, Ancient Greek: εξώρασον, ράσον exorason) is a voluminous garment worn over the inner cassock by bishops, priests, deacons, and monastics as their regular outerwear. It is not worn by seminarians, readers or subdeacons in the Russian tradition. In the Greek tradition, however, chanters may wear it in church, usually with no inner cassock beneath but directly over secular clothing. The outer cassock should be worn by a priest celebrating a service such as Vespers where the rubrics call for him to be less than fully vested, but it is not worn by any clergy beneath the sticharion. It may be worn with the bottoms of the sleeves turned back, which are sometimes faced in a contrasting colour. The Greek version tends to be somewhat lighter weight and more fully cut than the Russian. It is originally a monastic garment, and in the Russian tradition a man must be explicitly blessed by the bishop to wear it following his ordination to the diaconate. A cassock vest ("kontorasson" (κοντόρασον), "amaniko" (αμάνικο), "gileko" (γιλέκο)) is sometimes worn over the inner cassock. This is a closely fitted collarless vest, usually falling slightly below the waist. The vest has its origins in the outer cassock and therefore should be worn only by clergy and monastics who would, in formal or liturgical settings, wear the outer cassock. A cassock coat may be worn on very cold days, with the same cut as the outer cassock but slightly larger and of heavier material. It may or may not have a fur-lined collar. The coat is worn over the outer cassock, although many clerics may wear it in lieu of a coat on colder days. The cassock can also refer to a loose-fitting, pullover, hip-length jacket worn by ordinary soldiers in the 17th century. A cassock has attached sleeves and is open down the sides, similar to a mandilion. Such garments are popularly recognized as the formal uniform of the Musketeers of the Guard in The Three Musketeers – though this is suspect historically. ^ Online Etymology Dictionary and American Heritage Dictionary of the English Language. Retrieved 14 March 2010. ^ "Collins English Dictionary". Collins English Dictionary. Retrieved 25 August 2014. ^ "Instruction on the Dress, Titles and Coats-of-Arms of Cardinals, Bishops and Lesser Prelates, 28 March 1969". Fiu.edu. Retrieved 25 August 2014. ^ "''Valde solliciti'', I". .fiu.edu. Retrieved 25 August 2014. ^ "The Cardinals of the Holy Roman Church: Guide to documents and events". .fiu.edu. Retrieved 25 August 2014. ^ "England & Wales 1550–1850, s.v. "Clerical dress"". Catholic History. 12 November 1918. Archived from the original on 21 October 2013. Retrieved 25 August 2014. ^ "nainfa "adopting the English word simar" - Google Search". google.com. Retrieved 23 September 2015. ^ "Edward McNamara, "Birettas and Academic Hats at Mass"". Ewtn.com. Retrieved 25 August 2014. ^ "Italy in the 16th century". Threadwalker.net. Archived from the original on 25 March 2012. Retrieved 25 August 2014. ^ "Dressing the Italian way". Aneafiles.webs.com. Retrieved 25 August 2014. ^ "The Italian Showcase - Chris at the Realm of Venus". Realmofvenus.renaissanceitaly.net. Retrieved 25 August 2014. ^ Edwards, Nina (15 December 2011). On The Button. I.B.Tauris. p. 178. ISBN 9781848855847. In the Roman Catholic version the 33 buttons are said to represent the years of Jesus's life; in the Anglican the 39 buttons are thought by some to represent the 39 Articles of Faith. The Ambrosian cassock has only five buttons, with a broad sash at the waist; the French cassock has buttons elegantly up the sleeves as in a modern lounge suit; Jesuits prefer a fly fastening and no buttons on show whatsoever. ^ "See for example". Retrieved 25 August 2014. ^ "Image: r20w.jpg, (111 × 252 px)". nikitatailor.com. Retrieved 23 September 2015. ^ "Image: v1w.jpg, (135 × 252 px)". nikitatailor.com. Retrieved 23 September 2015. ^ "Image: 106ant_exot.jpg, (480 × 640 px)". kwvestments.com. Retrieved 23 September 2015. ^ "Image: furw.jpg, (121 × 252 px)". nikitatailor.com. Retrieved 23 September 2015.